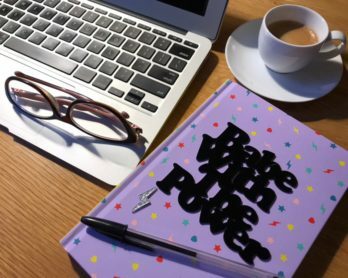 I recently realised that it’s been a while since I wrote about my adventures in sewing for Rarely Wears Lipstick, even though I’ve been doing a fair bit. I did a one-day feminist embroidery workshop with artist Jess De Wahls in January 2017, a tie-making workshop at the Jewish Museum in April 2016, and a one-day introduction to embroidery at Hand & Lock in May 2015. Lots of hand sewing! However, one thing I’d never got around to having a go at was CAD embroidery. I arrived at the east London studio just after Eleanor, who was already enjoying a drink and a breakfast pastry while she pondered potential patch designs. There were some examples on the workbench, showing a variety of different styles and stitch types for inspiration, and they certainly opened my mind up to possibilities I hadn’t considered. Once everyone had arrived we got an introduction from the tutors, explaining how the workshop would be structured and giving us an overview of the whole process. 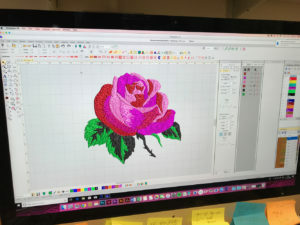 After being shown some basic techniques using the Wilcom Embroidery Studio software, we were then shown the process of digitising an image. 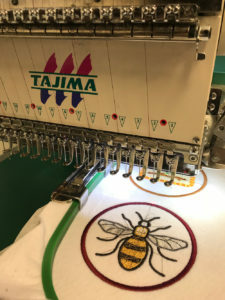 Basically, you import an image of your choice and then draw round the various sections of it, which you outline or fill-in with the stitch type and colour of your choice. 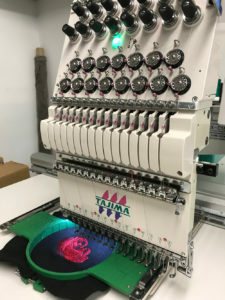 You can make a patch that’s as simple or as complex as you like, and the better you become at the digitisation process, the more intricate your patches can become. 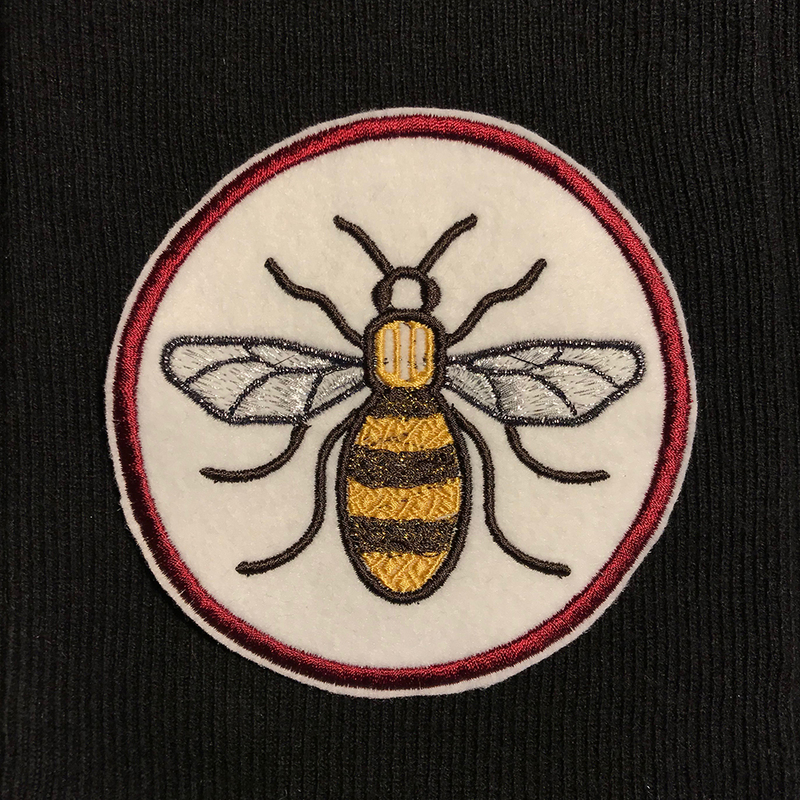 I chose a photograph of some bee graffiti in Manchester as the starting point for my first patch. Using a Mac that was running Windows proved tricky at first, as the software didn’t always do what I expected, but after a bit more assistance from the tutors I got the hang of drawing around the bee’s legs and then mirroring them to quickly complete the other side. At one point I was worried about my slow progress and convinced I’d only have time to complete one patch, but my outlook became much more positive once everything started to come together. I was originally planning quite a plain bee, but in the end I decided to choose textured stitches when filling in the body and the wings. I also went for a couple of metallic threads in my final selection so that the wings would shimmer. 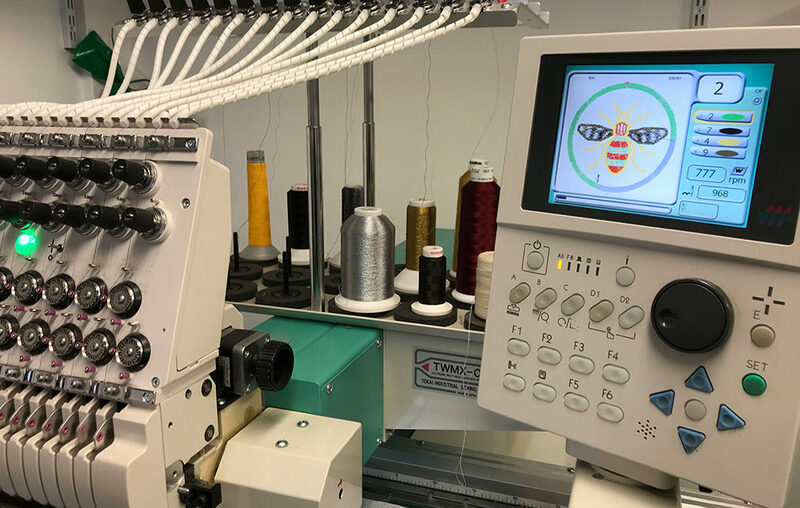 After a well-deserved break for lunch, when Eleanor and I wandered around the rather lovely Broadway Market and the tutors got the machines set up, I got back in time to watch as my bee patch was stitched. It’s really quite mesmerising! There’s some video footage on my Instagram (second and third images in the set), if you’re interested in seeing how fast this part of the process is. The completed patch is below, with the excess threads snipped off as best I could. 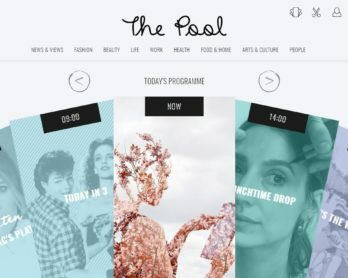 When we moved onto our second design, I was a bit stuck for ideas at first. 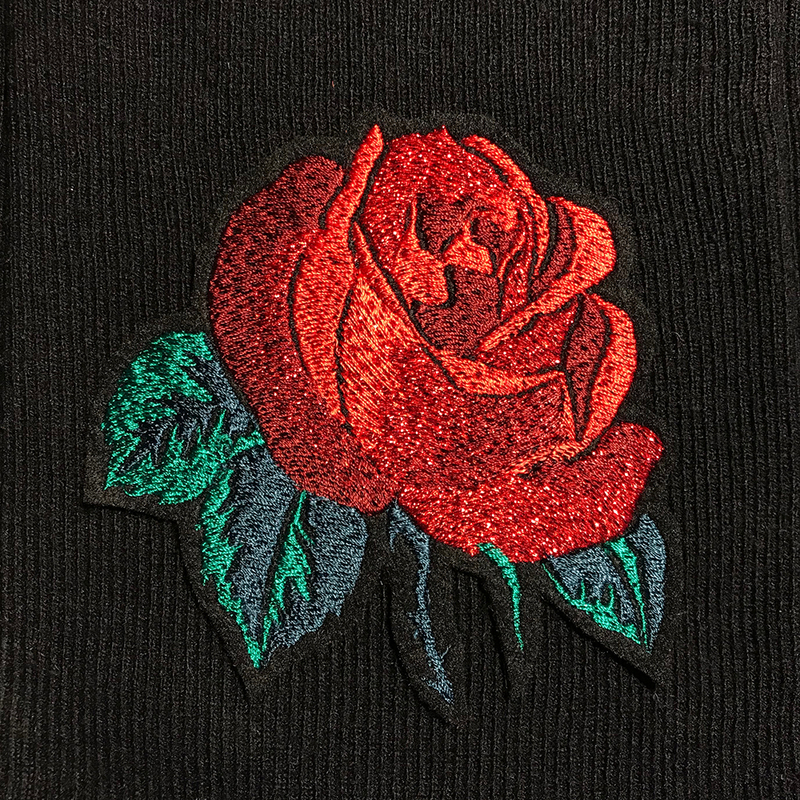 I wanted to tackle something a bit more complicated for the digitisation process, now that I’d got the hang of it, so in the end I opted to make a patch out of one of the roses on the vintage scarf that was the inspiration for my tattoo. I decided to plan the shapes of my rose carefully, so that I could give it depth using different colours but with the same type of stitch fill on each section. I had to ask for help importing my image, as it needed rotating and resizing to fit inside the dimensions we were given, but I soon set about drawing round each of my sections. It turned out to be much more complicated than I thought, and reducing the total number of thread colours selected led me to try out some interesting gradient effects stitch over the top of solid colours. As you can see from the shot of my screen further up this post, it looked pretty garish while I was working on it because the on-screen colours don’t have to directly reflect thread choices – the pinks and reds helped me better see the overall effect. In the end, I again decided to go with some metallic threads in my choices for this second patch, but went for a black felt background instead of white. I figured this would help the colours stand out a bit more, and it was really exciting to watch this one get stitched too. As the second one took me so long, my rose was the last patch to be stitched before we finished the workshop. 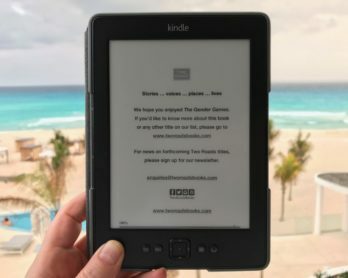 You don’t have to know anything about embroidery to sign up for this class, but having now done it, I’d say that a basic grasp of IT will definitely help because those of us who were comfortable learning how to use new computer systems picked everything up much more quickly. That said, all the participants came out with two completed patches at the end, which was great. I was very pleased with my finished patches, although I still need to find time to photograph them in natural light so that the details show up better than in these shots! Overall, I can highly recommend the London Embroidery Studio classes if you want to learn machine embroidery from expert tutors. I achieved far more than I thought I would during this workshop.